Political unrest has almost destroyed Egypt’s tourist industry, but Nile cruises remain popular and largely unaffected Anthony Nicholas took a memorable trip to the Land of the Pharaohs. The Nile at sunset. A felucca arcs soundlessly across the blood red river, the sail canted at a crazy angle. The doleful wail of the evening call to prayer floats through the air, mingling with the frantic chirping of millions of crickets. On the west bank of the river, buildings turn black against the reddening sky. The air is as warm as toast. I am taking in this amazing scene from King Farouk’s one-time private terrace at the fabled Old Cataract in Aswan. Sunset cocktails at one of the most famous hotels in the world are a final, fitting ending to an adventure that saw us meander through the very heart of ancient Egypt. A voyage through five millennia of matchless human history. 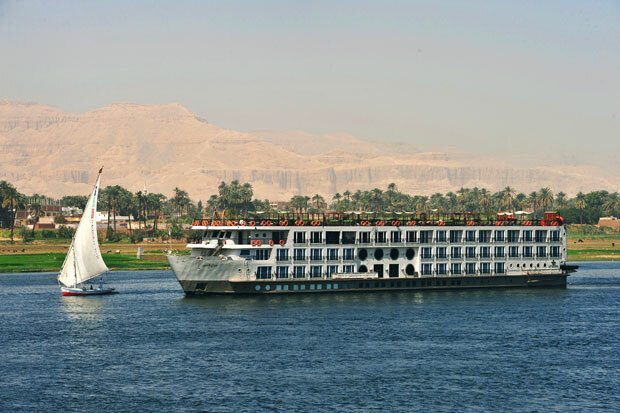 We had begun with a late evening arrival into Luxor several days before, and an immediate transfer to the MS Mayfair, touted as one of the finest boats still plying the ancient waterway. After a long day’s travel, the cool, air-conditioned interior was more than welcome. 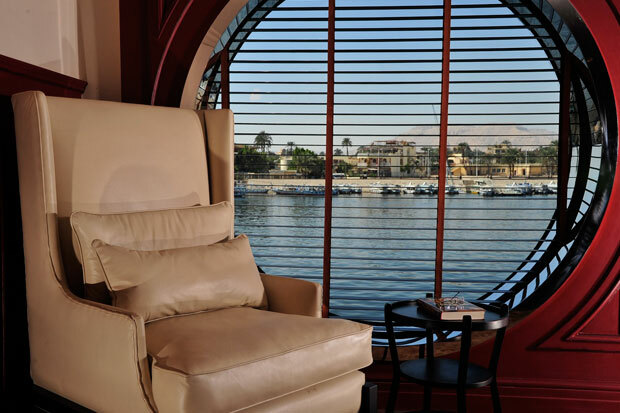 While many of the Nile river boats are still laid up awaiting better times, the MS Mayfair is still making the weekly, seven-day round trip from Luxor, all the way down to Aswan and back. A quick look around revealed a very plush, practical base from which to enjoy the looming adventure. My cabin, right forward, had floor-to-ceiling sliding doors leading out onto a balcony. In truth, this was more of a ledge, with a couple of chairs and a small glass table shoehorned onto it. I soon learned that, by putting the table just inside, I could make it pretty cosy and comfortable. During our short bursts of cruising the river, I spent a couple of languid hours out here, just watching life on the old river drift by. It was a marvellous little vantage point. Inside, a big, comfortable double bed allowed me a very good night’s sleep. There was a sitting area, and plenty of storage space, plus a small refrigerator. The bathroom was a good size, with an excellent shower/tub combination that proved reliably good. 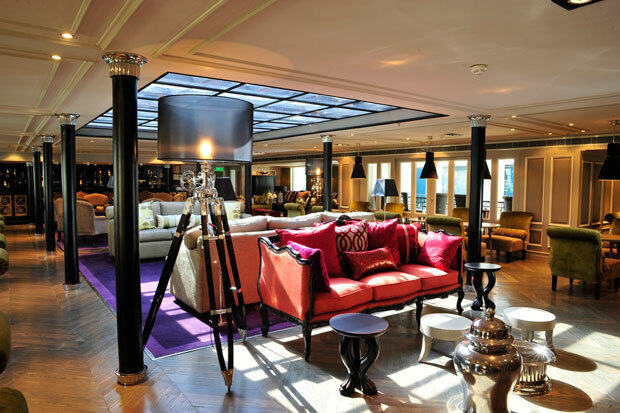 The entrance lobby on the MS Mayfair is two storeys high, beautifully lavish and expansive, and overlooked by a mezzanine lounge area that opens onto the main lounge, with its pair of opening side balconies with fantastic views over the river. My only gripe is that both of these are for smokers. I can understand the need for one, but two? This central lounge also features a large main bar, and a sizeable dance floor. It is the focal point for after dinner entertainment for those who could bring themselves to remain inside. Truth be told, it was almost deserted after midnight, as is usual on most river boats. Downstairs, the main dining room is airy, expansive, and covers the full width of the boat. Flanked by walls of floor to ceiling windows, it offered buffet breakfast and a set, three course lunch that usually featured very good local produce. Fish and chicken dishes predominated, and these were often excellent. Dinner was a three course meal, usually with a choice of two courses for each. Orders for dinner were generally taken during lunch, so service on the evening was prompt and, again, the quality was superb. Desserts were self service from a central buffet. I have to say that the quality of the food was the best that I have ever experienced on any Nile cruise. That food was filling, well textured and, within certain parameters of availability, very good indeed. With free wine included at both lunch and dinner, these meals became the focus of social life on board. But the true crowning glory was the sun deck. The upper level of the MS Mayfair looked like nothing less than a floating version of South Beach. 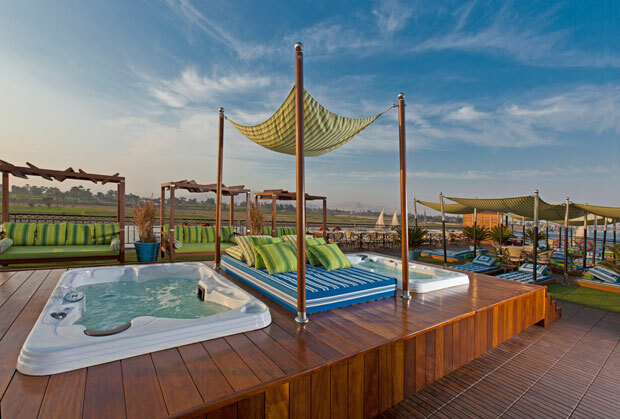 There were rows of wooden, canopied sun beds, a whole series of plush, padded sun loungers, an upper deck bar and shaded seating area and, wonder of wonders, even a pair of centrally sited, shaded Jacuzzis. Shrubbery and potted palms, sprinkled among all the plush, pinstriped lounging stuff, gave this upper deck a very relaxed, raffish feel indeed. It is no exaggeration to say that you could use the MS Mayfair as a deluxe luxury hotel for a week without ever setting foot ashore. But oh my, tempting as that could be, what wonders you would miss out on. Just across from that narrow gangway, an ancient, inscrutable land stands proud, compelling, and utterly magnetic. The sights and stunted remnants of ancient Egypt constitute what is arguably the greatest theme park on earth. Five thousand years of unparalleled, matchless history crouch along both banks of the Nile, their facades bleached almost bone white by millennia of exposure to a pitiless, eternal sun. Even Napoleon was awed by what he saw. And no matter how many times you see them, it is impossible to be blasé about the awesome series of temples that still stand like petrified exclamation marks in Luxor. 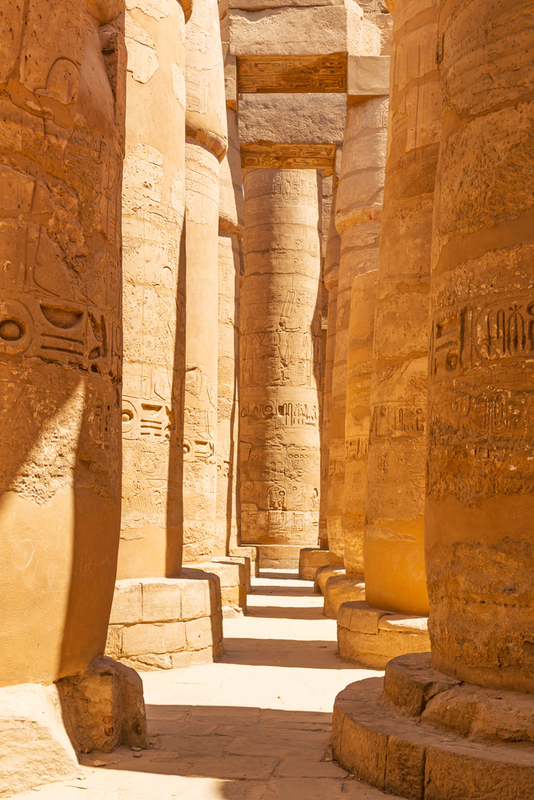 At Karnak, a giant, sandstone forest of one hundred and thirty four enormous, hypostyle columns loom against a powder blue sky, still engraved with hieroglyphics from their bases to the tops of their columns. An avenue of almost ramrod straight, ram headed sphinxes reposes in silent, shattered majesty in the approach up to the immense pylons that still guard the inner sanctum. What they must have looked like when new, and adorned with multi coloured frescoes, almost defies comprehension. The sights, sounds and ruins of this fabled, faded land filled our days. Uniquely, we were able to visit Howard Carter’s house on the west bank of the Nile, in the area that the ancient Egyptians traditionally regarded as the land of the dead. The discoverer of Tutankhamun’s tomb spent 10 years residing in this white washed adobe, with its rattan furniture and open range cooking stove. It was amazing to see such a perfectly preserved time capsule, with its authentic old record player and turn of the century cooking utensils. Despite the warmth of our hosts, I still could not shake the feeling that I was somehow intruding. An absolute high point was the superb quality of our guide, who stayed and travelled with us for the duration of the voyage. His knowledge, passion, enthusiasm and erudite descriptions of the facts and characters of this fascinating land contributed massively to our enjoyment of the trip. We often started our excursions quite early, in order to avoid the worst of the heat. 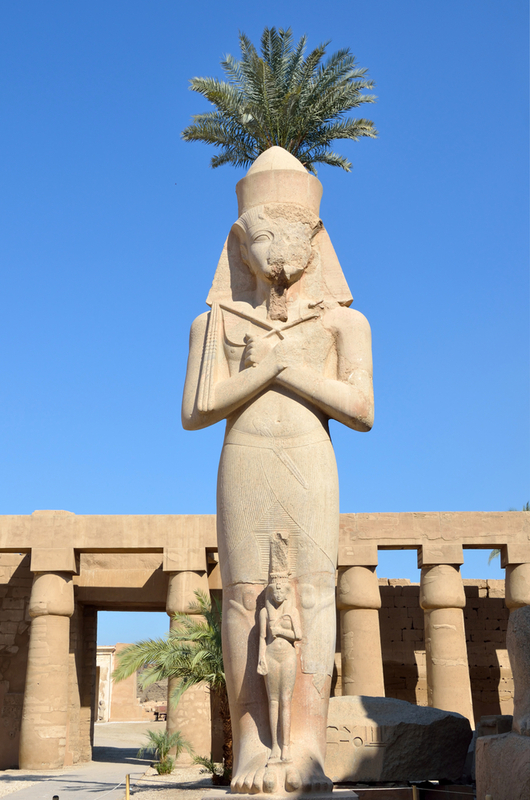 But one of the best was an early evening sortie out to the Temple of Sobek, the crocodile god, at Kom Ombo. Whether the sight of some 22 mummified crocodiles, of various sizes and savage appearance, was the best of pre dinner appetisers was open to question, but there was no doubt that the mind and the curiosity were incredibly well fed. My personal favourite remains the reconstructed Temple of Philae, at Aswan. Faced with rising Nile waters, the entire complex was dismantled, and then painstakingly reassembled on a higher island in mid river. While the entire complex is a spellbinding masterpiece writ large in sandstone and intricate cartouches, it is the small, perfectly formed, rectangular masterpiece called Trajan’s Bed that I still rate as the most beautiful single building in all of Egypt. And our time on the timeless Nile itself was like balm, almost cathartic. Idle hours spent lounging in a lukewarm hot tub as we drifted past fields, mosques, cattle, and oxen grazing by the river banks. We ghosted past two-man fishing boats, swathes of idly waving reeds and asthmatic, spluttering tractors harvesting the fields. There was afternoon tea on deck, announced each afternoon by a tinkling bell at four, with sandwiches, cakes, and wonderful cookies. All of this helped to foster the illusion of a languid, lazy progression down this most ancient of water highways, Many of the sights and sounds would have been just as familiar to Akhenaton, Cleopatra, or even Rameses the Great himself. At no time did I feel anything less than perfectly safe, well cared for and, by turns, intrigued and amazed. Some will tell you that, as a destination, Egypt is ‘back.’ My considered opinion is that it never went away.